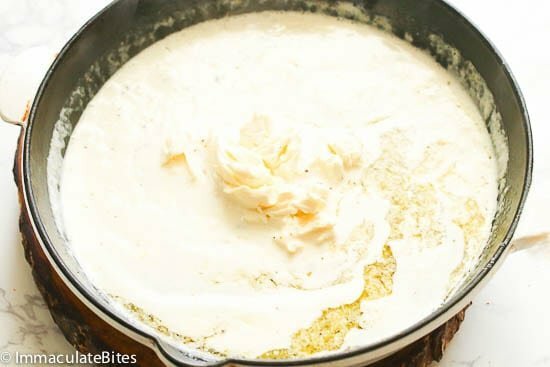 Homemade Alfredo Sauce – cheesy, creamy, smooth and flavorful Alfredo sauce made from scratch with that delicious garlic and Italian seasoning flavor. It comes together in 20 minutes. You won’t ever need the store-bought jarred sauce again! In case you haven’t noticed, I do love red tomato-based sauce! But when it comes to pasta, I’m kinda in the middle between red and white sauce…until now. 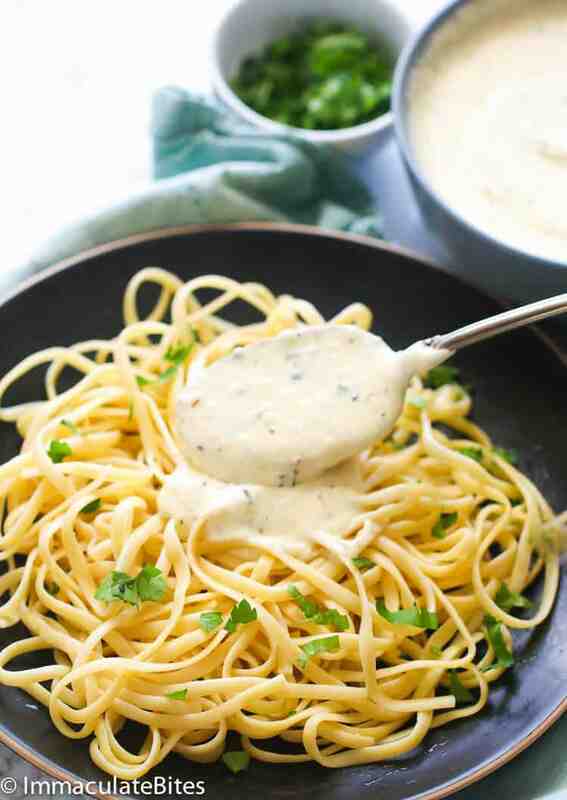 I have been raving for days with this homemade Alfredo sauce. As a matter of fact, I’ve added this creamy flavorful sauce on my dishes for about 4 days in a row last week. Can you imagine that? Well, you couldn’t blame me. 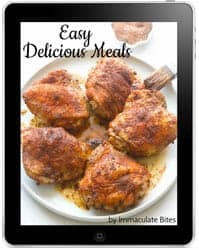 The flavors and textures are on point that I think it could rival well to that of a restaurant and it soooo easy to prepare; comes ready in less than 20 minutes. 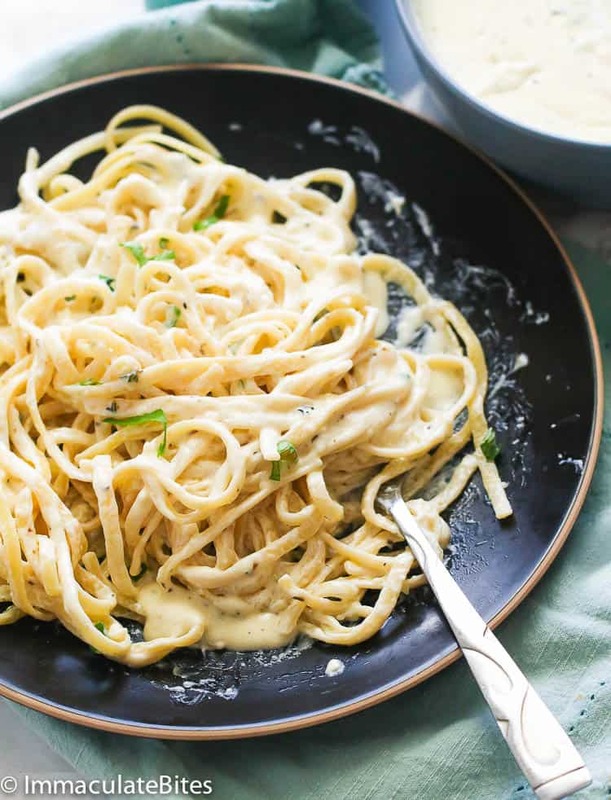 While I may have written this down before, for those who are still new on the blog, Alfredo sauce is a rich, creamy, cheesy and flavorful white sauce that originated in Rome, Italy. It’s usually made primarily of butter, Parmesan cheese, cream and a few other seasonings. 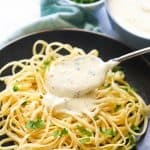 Alfredo sauce are traditionally added to pastas and has remain to be one of the top favorite pasta sauce in decades especially here in the U.S.
What is the difference between carbonara and Alfredo sauce? Both of these white sauces are hallmarks of Italian comfort food that are both creamy and white in color. 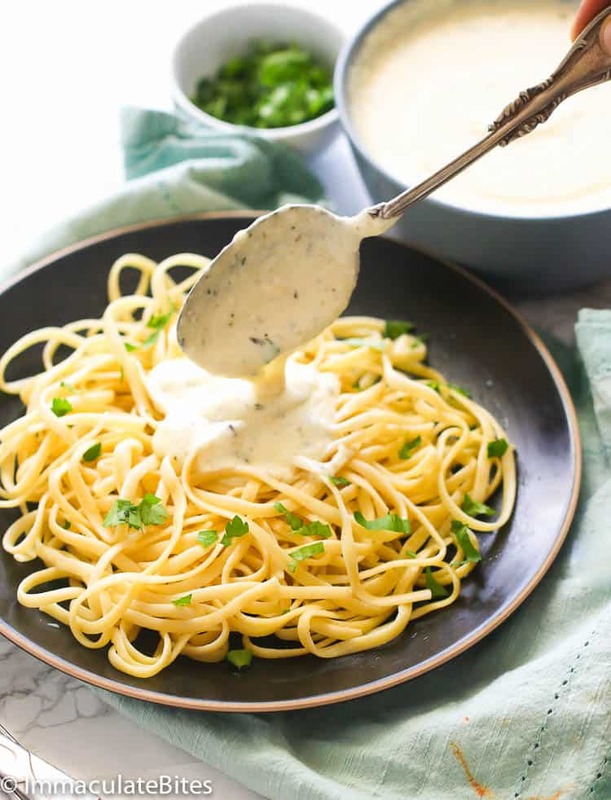 While they closely resemble each other in appearance, Carbonara and Alfredo sauces have couple of differences that you can spot. They may both have this creamy and velvety texture but the differences can be determined on how they feel on the tongue. The pancetta or cured pork found in a carbonara sauce adds a crunchy note to the silkiness of the sauce, whereas Alfredo sauce has this luxurious one-note texture all throughout with its buttery and velvety features. Furthermore, a carbonara sauce has more like an earthy, porky flavor while the Alfredo sauce is on the buttery side. Carbonara also has this bolder yellow hue since it includes egg yolks in it. 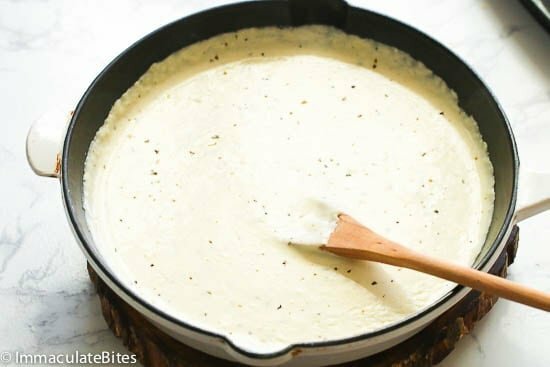 How to thicken Alfredo sauce? take 1 tsp of corn flour or corn starch and mix and dissolve it in a cold water ( 3 tsp cold water for corn flour and 1 tsp for cornstarch). Add the mixture while the sauce is still boiling. Now that’s a pretty good question. Frozen Alfredo sauce actually last for 3- 4 months, however, it is more likely to change its color to yellow. But don’t fret out! 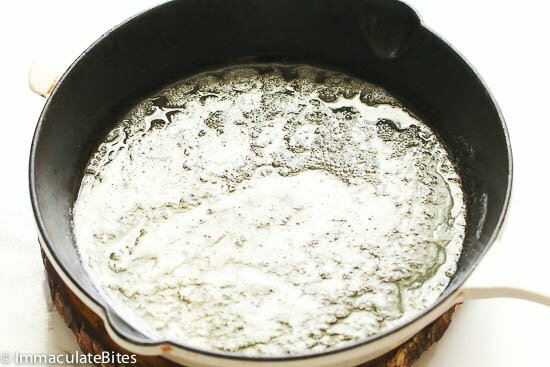 The separation of fat and water causing it to turn yellow will blend back together after thawing. Take note though, that Alfredo sauce is best frozen right after it’s made while it is still fresh. 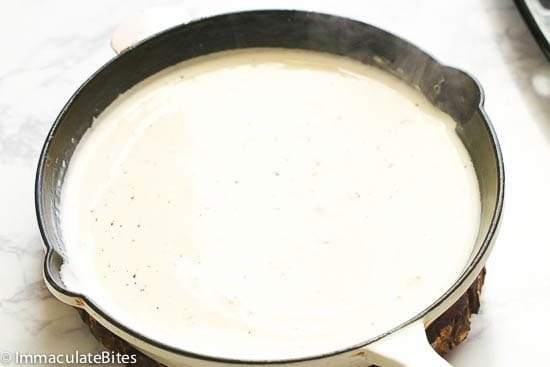 To freeze, simply pour the amount Alfredo sauce you wish to freeze in a resealable freezer bag, leaving some space to allow the sauce to expand during freezing. You also need to press it gently to remove any excess air before placing it in the freezer. And don’t forget to label it with the current date for tracking. Once ready to use, just thaw it in the fridge 12 hours to a day, whisk it well and simmer the mixture in the saucepan until it thickens. You can also store leftover sauce in the fridge for 2-3 days. Serve it over pasta and top with seared chicken like this family-favorite Chicken Alfredo Pasta. But wait, you can also serve Alfredo sauce on salads as a dressing, dips for crackers and veggies, and as sauces for casserole dishes. Or you could also enjoy roasted veggies (like cauliflower, brussel sprouts,and potatoes) slathered with Alfredo sauce. You see, you can use it not just on pasta! 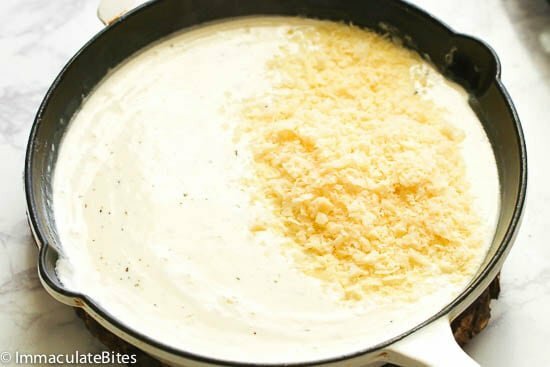 Use freshly grated Parmesan cheese as it melts easily into the sauce. You can replace Parmesan cheese with Parmigiano-Reggiano or Fontina. 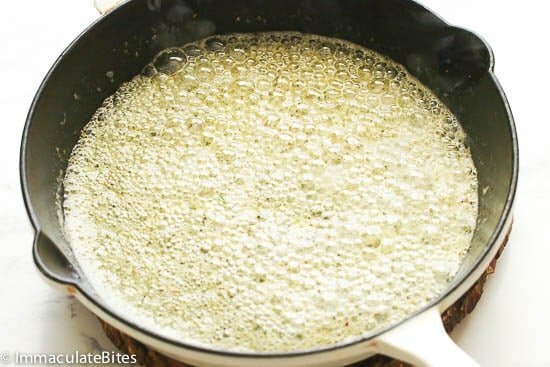 If your sauce keeps on breaking (butter separates from the sauce like an oil), your heat could be way too high and the milk has scorched causing the butter to separate. You don’t want the sauce to boil in this recipe. Add a bit of cayenne pepper if you want a little kick to your dish. 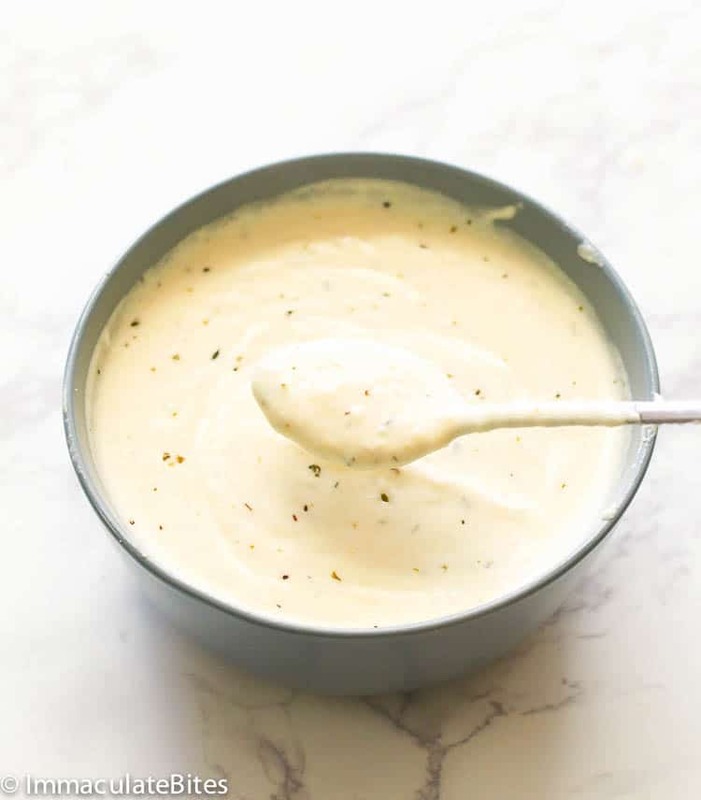 Homemade Alfredo Sauce - cheesy, creamy, smooth and flavorful Alfredo sauce made from scratch with that delicious garlic and Italian seasoning flavor. It comes together in 20 minutes. You won't ever need the store-bought jarred sauce again! 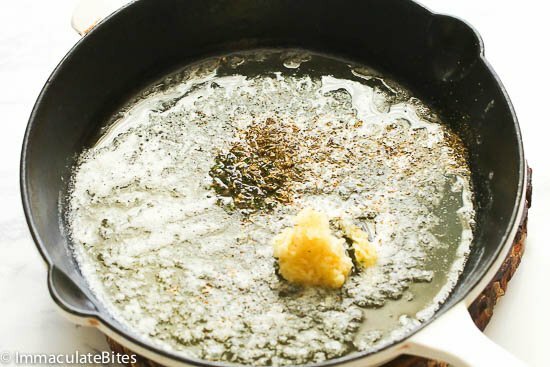 Heat up skillet or sauce pan on medium heat then add butter to the pan followed by garlic, thyme and Italian seasoning. Saute for about 1-2 minutes, or just until the garlic is soft and fragrant. Turn the heat down to medium-low. 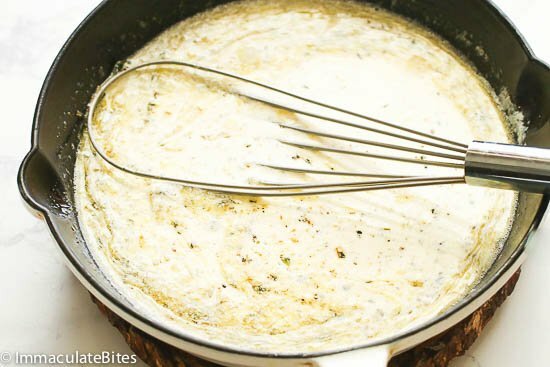 Whisk in cream and milk , then add cream cheese while whisking, until blended. Add Parmesan cheese and continue to whisk until smooth. Reduce heat to a simmer, then season with salt and pepper. Simmer for about 3-4 minutes until it starts to thicken. Turn off heat and toss with pasta. Or let it cool then store in the fridge until ready to be used. Heat up skillet or sauce pan on medium heat then add butter to the pan. Followed by garlic, thyme and Italian seasoning. Saute for about 1-2 minutes, or just until the garlic is soft and fragrant. Add Parmesan cheese and continue to whisk until smooth. Reduce heat to a simmer, then season with salt and pepper. Simmer for about 3-4 minutes until it starts to thicken. Turn off heat and toss with pasta. Or let it cool then store in the fridge until ready to be used. Thanks for all you do Imma. Bon appetit. Hi Ed, Parsley is mainly used to garnish the Alfredo sauce – the specks you see are from the Italian seasoning . Thanks for taking time out to share your thoughts with us. I hear you ! Need to post some Mardi Gras recipes next month. Happy Cooking !!!! How long can this stay in the fridge before being used? Hi Colette. Safest one would be about 2-3 days.